Founded in 1883, the Radnor Hunt facility sits on 6,000 acres of surrounding land used for hosting a wide variety of events, from weddings, to its namesake of foxhunting, to this day’s special event, the 20th annual Radnor Hunt Concours d’Elegance. A Concours d’Elegance is the outlet for elite, immaculately re-mastered pieces of machinery like automobiles and motorcycles to be judged for awards. If you read our recent article on Redline Restorations, you’d know that the history surrounding vintage automobiles is often more fascinating than just seeing the vehicles in good condition. 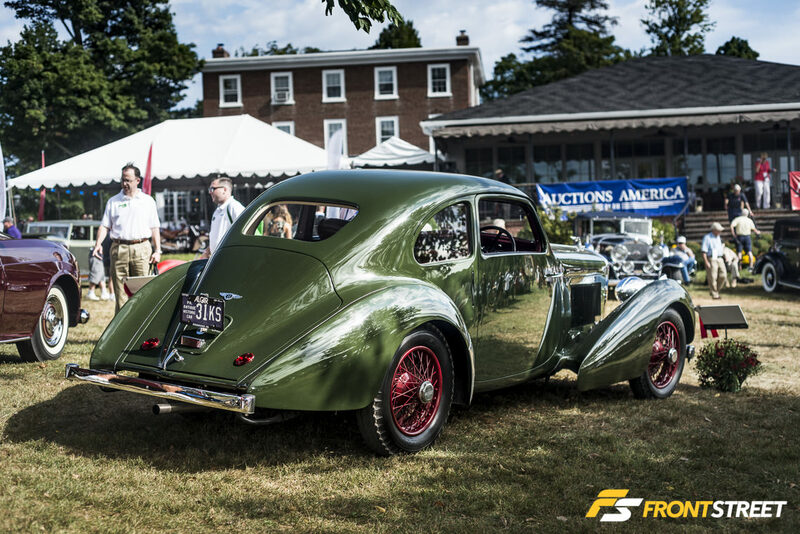 Combine those great stories with a better-than-new restoration of a rare vintage automobile and you’re starting to paint the picture of what makes a Concours event so special. Cars like this 1959 Lotus 18 Formula Junior inhabited the grassy hills of the facility. The Lotus 18 was the first single-seater car used for every kind of racing from Formula One to Formula Junior. Sir Stirling Moss even drove one of these cars to a win at both the U.S. and Monaco Grands Prix in 1960. This particular example was powered by a 120 horsepower Ford 105E engine, and wears multiple colorful stickers on its rear roll-bar, which is evidence that this car – even in its ripe condition – is still pushed to its limit on a racetrack in a vintage racing series. Wearing a two-tone paint scheme, this red and white 1957 Ferrari 500TRC Spyder was a sight to see once the sun peeked out from behind the clouds. The beautiful lines of the car stretched from front to back, as the curves of the wheel arches blended seamlessly into the aerodynamic headrest for the driver. 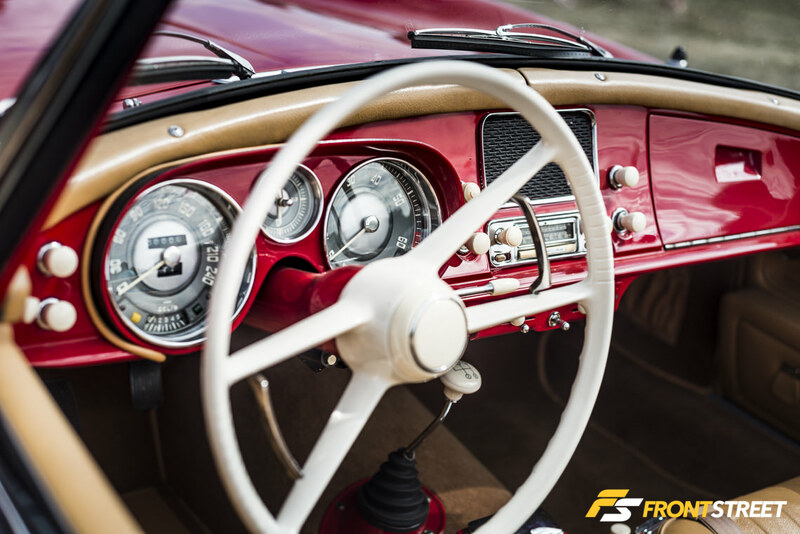 With a very simple instrument cluster, the center gauge predominantly displays “Giri” – or revolutions in Italian. This particular example was raced thoroughly in 1959, then sat until its current owner – none other than JW Marriott, Jr. of the famed Marriott hotel chain – purchased it in 1983 and restored it. He subsequently sold it at auction in Monaco in 1991, bought it back in 1997, and then restored it yet again to its current condition. Remember earlier I said stories were important? This 1938 Bentley 4.5-Litre Coupe has remained in the same family ownership since its original purchase nearly eight decades ago! After it was received at the Port of New York, the car was immediately driven across the country for a wedding, as a sign of the Bentley’s smoothness in that era. This particular 4.5-Litre Coupe received its coachwork by Vanvooren of Paris, which raises its value to the next level. Another vintage Formula Junior car, this 1959 Lancia DeGrada is chassis number one of nine built, with only six still in existence today. The engine inside relies upon a Fiat block combined with an incredibly rare DeGrada cylinder head, for a unique powerplant stuffed inside the aerodynamic lightweight body. The two small humps behind the front wheels house the engine’s carburetors, with two exhaust runners exiting directly below. However, this engine layout doesn’t follow common design and actually dumps the exhaust on the opposite side of the intake ports, flowing the air/fuel mixture from one side of the engine to the other throughout the combustion process. Unrestored is not often muttered at events like this because the chances are very slim of cars being in a presentable condition so many years after their original production; this car, however, is one of the exceptions to the rule. The 1967 Lancia Fulvia Sport Coupe was purchased by its current owner 49 years ago; the original coachwork by Zagato has held up brilliantly over the years and reflects the low 17,000 original miles accrued on the chassis. This car was equipped with four-wheel disc brakes as standard equipment long before most other sports cars offered them as an option. Although they provide an interesting visual appearance, the exterior pannier tanks on this 1955 Lancia D50 Formula 1 car kept the fuel load focused between the wheels instead of being located in the tail, as other competitor’s cars were designed at the time. The D50 was built for Formula 1 competition with no expenses spared, and turned out to be such an expensive undertaking it assisted in the bankruptcy of the company. Two-time World Champion Alberto Ascari driving one into the harbor at the 1955 Monaco Grand Prix probably didn’t help either. Although this particular car is a replica, ex-Lancia Corse engineers and veteran team mechanics remade its body and chassis. Now a famous Caterham body style, the Seven was originally designed by Lotus founder Colin Chapman. It follows his theory that performance lies in lightweight simple designs. This car’s current owner purchased this 1962 Lotus Super Seven S2 in 1975, when he was just 20 years old. The original frame has been extensively restored and the body was renewed with a new complete aluminum skin. Arguably the most recognizable automotive design in the world, the Porsche 911 is sure to stand out no matter what cars are positioned around it. This one-owner 1972 Porsche 911S made its show debut at this event with a crowd surrounding its panels all day. Note that’s not the fuel door under the rear window; specific to 1972, Porsche offered an exterior oil fill door, which poured directly into the rear-mounted engine’s oil tank. One thing that separates a Concours d’Elegance from other car shows are the standards to which each vehicle is judged. If the owner can provide proof and records of previous ownership, maintenance, restoration, or historic events the car was a part of during its previous existence, it’s worth big points with the judges. During the event, the judges were present across the show field in their uniform garb, which included a navy blazer, khaki-colored pants, and a clipboard filled with checklists. These lists documented the challenge of every great restoration – for the finished vehicle to perform the way it was originally intended. If the car has headlights and turn signals, those headlights and turn signals need to work as they were originally designed. Every inch of each registered car in the show was scoured in order to decide the rightful recipients of the day’s “Best Of” awards. In the past, Toyota was known across the globe as a manufacturer of affordable economy cars, but when they unveiled the 2000GT in 1965, the world took notice. The design was unlike anything the company had previously released, and believed to be created by a German-American designer who was working for Yamaha at the time. There were 84 left-hand-drive vehicles tallied when the final production numbers were recorded. The 337 limited-production units were priced over $7,000 when new – approximately $50,000 today – while recently a certain example fetched over $1,000,000 at auction. This ultra-rare 1967 2000GT has been covered in a new coat of Bellatrix Yellow paint, but otherwise remains unrestored. Previously-raced cars are very popular at these events. Luxury and performance are often the common themes throughout automotive culture, while racing vehicles tend to be much harder to source, as most didn’t survive past their motorsport duties. In this case, the 1966 Porsche 906 – or Carrera 6 – was created to become the company’s last street-legal racecar, with only 50 production examples created to meet homologation requirements. This particular car finished fifth in the 1966 Targa Florio race, before being converted to a 906 Spyder for further racing in the 1971 season. This 1958 BMW 507 Roadster was quite an expensive car when it was released, selling new for $9,000 – approximately $75,000 today. BMW only produced 253 units due to low sales numbers, and many vehicles like this particular example were delivered to other countries like Venezuela. The spotless restoration on this particular example was completed earlier this year in March. I personally enjoyed the unique instrument panel and the suitable font of the numbers on each dial. The event is also dog-friendly, not only showcasing the talents of the foxhunting hounds boarded at the club, but also allowing guests to enjoy the show with their own furry friend. Elsewhere on the grounds outside of the Concours event, a club/enthusiast parking lot contained some treasures of its own. Although most of the vehicles found in this lot were much newer than those on the other side of the ropes, they still encompassed the same rarity and quality of the elusive cars inside the judging area. Cars like this virgin Ferrari F40 made the trip outside the show area well worth it. The F40 is considered by many to be the pinnacle of Ferrari sports cars. Known for its lightweight recipe and usable power this car came equipped with a twin-turbocharged V8 engine, tucked inside an aluminum and carbon-fiber chassis. The result was a raw performance vehicle with so much clout, that it’s still a favorite among enthusiasts today despite the production of more technologically-savvy Ferrari models produced in the days since the F40 ruled the road. Also guilty of adopting the lightweight philosophy was this spotless Morris Cooper. Originally a performance version of the Morris Mini, this little car influenced an entire generation of automobiles with its front-engine, front-wheel-drive layout. This example has been well-maintained; I especially liked how the faux European license plate was favored in its mounting location, over the necessary Maryland sample. Last but not least, the Lusso. This beautiful 1964 Ferrari 250GT Lusso Berlinetta is one of 350 examples produced, and had a steady stream of onlookers poring over it during the show. Lusso means luxury, and Berlinetta describes the coupe body style. This 250GT made its restored show debut at this event. The 250GT has such smooth and crisp bodylines with perfect proportions; it is widely accepted as the peak of Scaglietti coachwork. I finished the day walking back through the entire show field one more time, basking in all of the excellence that was on display in one place. Each judged car would be vying to take home a coveted glass award when the presentation of excellence concluded. This collection of cars left me speechless, and at the same time wondering how most of these vehicles would fare on the racetrack in their present condition. Luckily, I’m covering a vintage racing series in my next post, so be on the lookout for that, too.